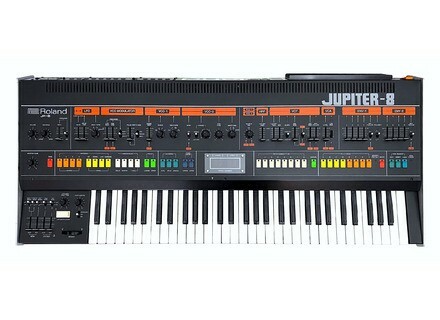 Jupiter-8, Analog Synth from Roland in the Jupiter series. JP8's review"Best analogue poly-synth ever?" The JP8 is one piece of gear I will never part with. Its sound is huge (or thin if desired), warm and very useful for any kind of music. As a composer of film music and new age, I really like the slowly drifting string sounds with a litte filter growl on the bottom end. I just love the sound of the JP8. Tweeking your sounds is a breeze! Just turn the knob or shift the lever to the desired position and you will be instantly gratified with the sonic results. This is the true power of analogue synthesizers: its hands-on editing. As these synths get older (production year 1983) you're bound to run into some foults like memory loss because of the empty battery that needs to be replaced. It's not unlikely that some mechanical faults will happen in time. I had to replace a voice-chip myself in 1997. As spare parts are getting more rare by the year, it is good to keep that in mind and service your unit regularly. Is this the best analogue polyphonic synthesizer ever? Considering the other synths from the early 80s, I'd say ' Yes'! It is stable (after warming up and using the auto-tune), built like a tank and meant to last, and it has all the sonic power you'll ever need. studiohome's review (This content has been automatically translated from French)" super stable, great"
The keyboard is great, it's amazing after 30 years it is nickel, very nice, soft. I am mostly with electro. For some sounds must put an end, I torque to the Ensoniq DP4 + is really great. 13 years ago that I have. I love the stability, support autotune just after 5 minutes heating. The strength, reliability (the most reliable of all analog I had), the sound of course. The weight is his fault but hey you can not do everything. It is not easily did the same thing with this app is clear but true for most analos. The debate on the price is ridiculous and sterile (so is the collection of old cars, etc ... you believe a Citroen DS 80 000 euros is justified?!). We can make great music without a jupiter 8 it is clear, even though I love it. Notator's review (This content has been automatically translated from French)" JUPITER 8, 'the great'"
This is an 8 voice or cleavable Stackable 2 x 4 votes. For voice, he has 1 LFO, VCO 2, 2 filters (HPF, VCF), 1 VCA, 2 envelopes. It has a pretty nice arpeggiator. The keyboard is 5 octaves, not dynamic. It is not original MIDI, but can be equipped with a MIDI interface and some allow to add the dynamic pressure. I have noted that 'good' for this section, because of the limitations of origin, but that can pass 'perfect' by equipping it with a good MIDI interface, such as Groove Electronics, society unfortunately disappeared . It was designed with exemplary ergonomics: a button, a function, in addition, controls are arranged in a logical way, according to the diagram of the machine. It 'sees' what you do. The instructions are very clear and detailed. Editing sounds is easy, but take the time to 'dig', because the settings are interactive. From my experience, it is very robust, never crashed. The sound is great and 'living', the JP8 has a 'big' sound, fishing, definitely. This is not 'squeaker squeaker' is Star Wars. The sound is very bright, with a strong personality, very expressive. It allows a wide range of sounds, as long as you take the trouble to program sounds, and not just factory sounds like too often. My set is my lead synth, this is not the kind to stay behind, 'contained'. I since its release, it had cost me an arm at the time, but I do not regret it. It was sold off for a while, because it was neither South nor dynamic, but this is not the case now, especially with a good MIDI interface can overcome these drawbacks. It is true that it has become very expensive and highly sought after, but there have been only 3000 made, and some have disappeared. It has its incomparable, 'living', a JP8000, for example, can not find. petitsynthe's review (This content has been automatically translated from French)" Perhaps one of the tops of polyphonic, but ..."
(I should note that this notice is not complete yet)). Everything has been said about the features! Simple slider = a / knob by parameter. This does not mean that opportunities are not very important in synthesis for an analog (non-modular, but polyphonic). I think the sound is "rough", very raw, very restrained compared to a Prophet 5 for example because more stable at the VCO (more Japanese sound). It is very versatile, but it will send a multi-purpose external to a satisfactory result, except for the sounds "bass synth" which can be sufficed themselves (like all analog). I had in my "youth" (1997-1998) during a year: at the time I was not experienced enough to really master it, I bought it used more by "fantasy" (as many here) and I was a bit disappointed necessarily, "it's nice to play it, but how to integrate it easily into a component?" especially at the time I did not have a good level of play and more than did their virtual appearances: "What is certain is death hardware synthesizers, even analog!" (Quote from a vendor Piano Show at that time). I really wanted to give my opinion that if it's a great synth in absolute prices seem disproportionate now (mostly because it is hard to find!). After all we can do most basic analog sounds (the most useful part of a component) with a Juno 60 (I see that gasp!). We want to keep it for its sound but seeing the prices soar, it's probably too tempting to resell ("fatigue", lack of money and whim: to whom does it not happen ?) saw huge profit there is to it (I do not quote anyone). In my opinion, unless collector or afford the prices secondhand no longer justified. This super synthesizer with some connection to noon (or with a kit) contain just about anything to make her exit from your imagination, 2 running oscillator by using intensive-operational (or that particular sound) and some FET and PNP, unlike TB303 using NPN-pass, which gives a more aggressive (the transistors are no longer present in the TB303) not to mention on the envelope-based pwm amps op.Le Xmod is located after the selection of waveform we find the level of VCO and the Xmod balance (which enters the mixing process of two waveforms). effects, well I have to talk to you about the effects: inimitable, it looks like a "sonic landscape that is modulated in real time, no synthesizer can do that. Sounds like dens are well and saw that the noise (noise), capable of many things very "cool"
I have to correct prior notice. So revolutionary because it can maintain a low and a lead or an arpeggio and ground can be 2 splitter sounds on the keyboard and edit independently very very easily click on upper or lower and it publishes the selected sound ..
sonically speaking the 'touch' of JP8 is to play two sounds stacked (dual mode), sound can be used to attack and sustain each other or can be stacked 4 osc, 4 6 envelloppes filters (LPF 24; lpf12 hpf and 12 non-resonant), the sync, with the pulse, 2 LFO, modulation of the cross, the polarity of the envelopes (assignable Pitch CSO ....) yum, yum, there's plenty to do ..
some is a harbor dcb roland, on the other not, the disputes over the sound of two version of the processor (12 bits puis14) are sterile. Electronic still installs a bone end (5.1) MIDI IN and OUT (sysex) double the memory 128 has saved preset, everything is configurable and it is possible to control opening and closing the filter through noon, sync, LFO and arpeggiator. ... when the kit is installed, the machine becomes formidable because more modern in its use. edition of the sound is both simple and complex: everything is clear and effective, but this synth makes a lot of things, it goes without saying that it comes into its dual mode, when two bunk stamps there is a consistent depth of programing ..
otherwise everything works great, a flat filter for whistling but oscillates prefe ... not okay because it sounds hell of the synth and proposes ways to create miles fx. The sound of the roland jupiter8 is very special: it's a very broad and deep, seldom drive, he completed a magnificent five prophet in this sense, it's just a galactic see fluid, it seems that the sound is treaty ... it is actually very pure, very thick. the color of the sound is unique, very colorful, very hot, is the essence of the roland for me ..
on the other hand I can not hear the tb in this synth, and 101 sh either, these synths are more aggressive in their report the resonance, and are very cheap osc a side (the JP8 has 100% discrete oscillators) and they don 't possess an unfortunate integrated circuit ..
the sound is not the same caliber even if the tb and sh, (although very limited) is a sound all their own. the sound of jupiter8 is not acid or plastic, I find, again, Galactic and wet ..
At the pinnacle of a polyphonic prophet5 (v, preferably 2), MemoryMoog, CS80, sem. attention, its very distinctive and recognizable. ... Very very far from the plug. The TRS is a good Jupiter8 synth sounds with classic Roland can CRER with low or TB303 SH101 version but without the accents, tablecloths, mega techno sound version in 1992 and finally the beautiful sounds plthore vintage analog. But to say it quune JP8000 not recreating the same sound is wrong. Put a rack deffet numrique to Jupiter and you'll have something almost similar to JP8000 with a lot of convenience and less. The positives are the arpeggiator, the trs rsonance good, his look, his strong compared to the plastic thingy daujourdhui. Although it is Midif lengin among the best for technoman. Compared a super JX10 or DX1. A you know what you want to sound like before lacheter.On often used in our pieces is visible on our site. The edition of the sounds is very simple. Synth excllent gnrer for big bass sounds of the water or hot. TRS is a beautiful machine ui despite his great age is still my actualit got a strong personality with sound. It is a synth I've known for a long time but I could rev to purchase it a year ago.